Custom attorney notepads from our collection help attorneys, paralegals and other legal professionals to market their legal services with dignity! Attorney marketing is all about thoughtful investments which offers long lasting results. Personalized attorney notepads helps to achieve the same with sophisticated ease. 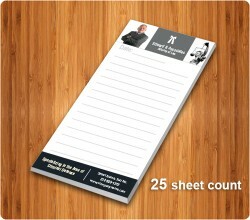 Attorneys who are expecting some astounding appreciation with minimum marketing efforts can always fall seek suitably imprinted promotional attorney notepads because it serves them above their expectations. Personalized legal notepad are usually sought by attorneys, paralegals and other law professionals with the intention of attracting new clients, strengthening loyal customer base, increasing referrals and establishing themselves as authoritarian entities. The benefits offered by these legal pads are immense in comparison to other regular promotional materials because it highlights the brand names for long a time, help to save money spend on marketing and helps to build loyal customer base without any added efforts. Users will think high of attorneys every time they take out these imprinted notepads for scribbling some information and will act accordingly whenever they require legal help.